Users often do not realize how dangerous it is to browse the Internet on a daily basis. Every single day you might be just a click away from such ransomware infections as Alpha Crypt. This malicious program, else known as the Alpha Crypt virus, can enter your system via the spam email or through an annoying pop-up that click on a random website. Then you need to scramble to remove Alpha Crypt from your computer, but the damage is already done because, first and foremost, this program encrypts your files. 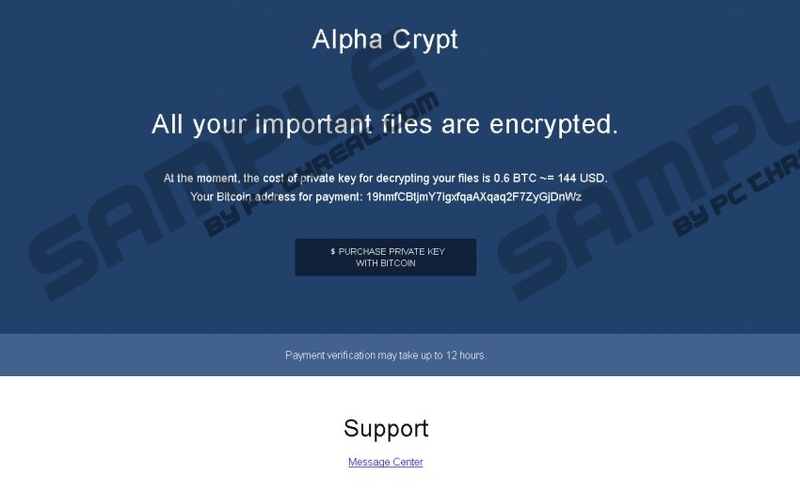 Alpha Crypt comes from the same group of ransomware infections as TeslaCrypt Ransomware, Cryptolocker virus, Coin Locker, ZeroLocker, and many others. In fact, Alpha Crypt happens to be just another clone of TeslaCrypt Ransomware, so whatever we experienced with the previously released infection, we can expect the same from the Alpha Crypt virus as well. The point is that, this program holds your files “hostage” in order to swindle you out of your money. But you mustn’t succumb to its threats because it leads nowhere. Even if you pay the ransom fee, you will not receive the decryption key that would allow you to decrypt your files. Thus, you should focus on removing Alpha Crypt from your system. Usually, when ransomware programs enter target computers, they lock down the desktop and display a notification that the infection has taken place and now users are given a limited amount of time to pay up. However, that is not the case with Alpha Crypt. Sometimes the main notification window does not open, and instead the program opens a text file via Notepad that contains all the necessary instructions, telling you what to do to decrypt your data. Our research specialists claim that accessing the website in the guidelines is futile because their server is always down. Thus, once Alpha Crypt encrypts your files, this is it. That is why computer security experts always emphasize how important it is to keep a backup of your files on an external hard drive or on a virtual cloud drive. Sometimes it might be possible restore the files with a decryption tool that you may find available for download online, but if you are not sure of what you are doing, it would be for the best to leave everything to professionals. Please acquire a legitimate antimalware tool that will remove Alpha Crypt and other dangerous threats from your computer. It is very likely that you have several Trojans and other malicious programs on your system because the likes of Alpha Crypt seldom travel alone. Once you have your computer cleaned, make sure you stay away from dubious websites in the future so that you would never get infected with a similar program again. Press Enter and when the page loads, click Run on the download dialog box. Install SpyHunter and launch a full system scan. Quick & tested solution for Alpha Crypt removal.